Aniridia is a congenital eye disorder also referred to as iris hypoplasia. At first glance, patients with aniridia appear to have no iris (colored part of the eye), but a closer look reveals the root of the iris. Though the condition can develop independently of other conditions, aniridia is often a symptom of another underlying condition. About 66% of aniridia cases are inherited from one parent. The PAX6 gene on chromosome 11 is affected. The remaining 33% of cases have no known genetic cause – spontaneous gene mutation. Between on in 50,000 and one in 100,000 infants are affected. There is a rare condition called homozygous aniridia where both parents pass a mutated PAX6 gene on to a child via chromosome 11. 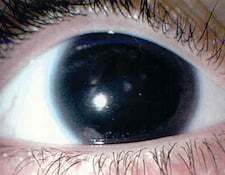 Homozygous aniridia almost always results in severe eye abnormalities or complete eye formulation failure. The condition is fatal. Aniridia is typically diagnosed soon after birth. Upon eye exam, doctors recognize what appears to be a missing iris. Upon further medical inspection, the iris root is intact. Genetic testing can verify diagnosis by an ophthalmologist. Treatment for aniridia depends on the structures of the eye affected by the condition. All patients lack a functional iris, allowing more than normal amounts of light into the eye. Special contact lenses with colored surfaces can be fitted to patients to reduce the amount of light that enters the eye. Patients using contact lenses require regular vision check-ups to ensure the cornea is not damaged. Iris implantation is another option though the procedure may only be performed during cataract surgery, in some cases. Patients receiving iris implantation must be closely monitored for aniridia fibrosis – formation of tissue around the anterior chamber of the eye. Aniridia does not affect pregnancy, though patients with Wilms tumor and aniridia do not typically have children. Wilms tumor is a deadly condition that often leads to early death. Aniridia is a genetic condition that is passed from parent to child in 66% of cases. If you have aniridia you are at increased risk of having children with the condition. Children born with homozygous aniridia have a shorter lifespan than children born with other forms of the condition. Lifespan is not typically altered in patients with aniridia, though complications may lead to vision loss. If there is an underlying condition associated with aniridia, life expectancy will depend on treatment and the disease process of the underlying condition.